This perfect home or a terrific investment property in the heart of the vibrant Lower East Side offers views to One World Trade Center, the Chrysler Building and the Empire State building. 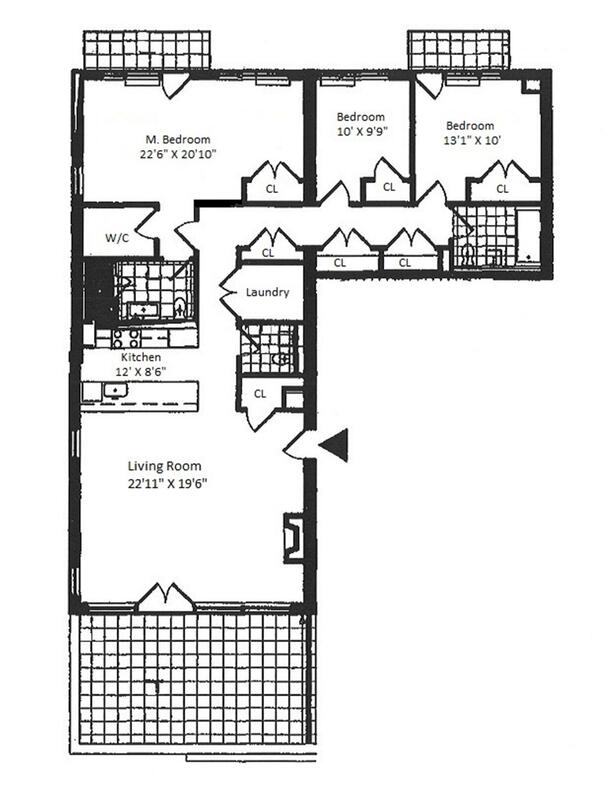 The 7th floor penthouse loft is drenched with sunlight, has 3-bedrooms, 2.5 baths, and boasts 1875 square feet. The apartment features central air conditioning, wide plank white oak flooring, oversized windows and high ceilings. The spacious living room features a working gas fireplace and custom built-in bookshelves. It opens onto a charming, west-facing, planted terrace with an automatic irrigation system. The terrace offers breathing taking views of the Manhattan Skyline. The grand master bedroom suite with an east-facing balcony has one walk-in closet and an additional large closet that is sizable with custom built-ins. The master bathroom includes an oversized rainforest shower, Tiger wood vanities and Italian double size trough sinks with Grohe fixtures. The two additional bedrooms are well proportioned with ample storage, plus an additional east-facing balcony and a separate bathroom that includes Zuma Soaking tub. When you're not patronizing the wonderful array of restaurants on nearby Clinton Street, patronize yourself in the apartment's chef's kitchen. Moss granite countertops and Wenge finish custom cabinetry. There is a Viking stove, Sub-Zero fridge and wine cooler, Miele dishwasher and a breakfast bar. There's also an LG washer and dryer in the separate laundry room and four storage closets with custom built-ins. In the basement, a private storage space. The building, built in 2005, is a well-maintained boutique condominium with a common, furnished roof deck, a health club, superintendent and part-time doorman. Houston Street is just steps away and there is easy access to the F/M, J/Z Trains, Essex and Union Markets, Whole Foods, plus all the entertainment and boutiques that enrich the appeal of the neighborhood and East Village. The unpretentious, no-frills attitude of the Lower East Side draws people from all lifestyles, contributing to the neighborhood's unique and eclectic identity. There is nothing like this available in the area.